Robbie Byrne talks to the self-confessed grandpa of Bloc Party, Justin Harris, on old feuds, new sounds and a bright future. Earlier this year, democratic socialism, the lifelong foe of American capitalism, rose above decades of mockery and disdain. A spiritual awakening of a nation locked by Trump fever, democratic socialism is the romantic balladeer to capitalism’s Wolf of Wall Street. Like its socialist frontman Sanders, Bloc Party, the almost-darlings of UK indie, were dead and buried eighteen months ago. Like Bernie, Bloc Party had an ideology to resurrect, one that peddled all too romanticised ideals, and yes, both had to battle doubters as they hurtled towards the twilight of their careers, unwittingly in sync. So the timing was immaculate, even discomforting, when Bloc Party’s first record in four years, propped in part by a new generation, dropped within a day of Sander’s historic Iowa Caucus tie. “I’m still not fully aware of everything and that’s fine by me,” begins Bloc Party bassist and self-confessed grandpa of the band Justin Harris. It’s a little over sixteen months since the former Menomena bassist was asked to join Bloc Party 2.0—two years after the outfit’s first headline festival tour culminated in the departure of stick man Matt Tong amid reports of cocaine use and pre-gig bust ups. The initial sessions, Justin tells me, were low commitment, a gentle introduction to life at Bloc Party. Nonetheless, joining the outfit full-time was far from a no brainer. “I had to give up part of my life to do this, but having said that, I’ve always admired them as musicians and people, so it wasn’t a difficult decision to make,” he says, before conceding that his own band, Menomena, is snugly placed on the back boiler for now. But as the months passed, Justin became enveloped within the project, transmuting his role from part-time newbie to Bloc Party’s de facto bassist. Still, widespread rumours of fraught Bloc Party recording sessions were never realised: “as far as the recording process goes, it was the easiest I’ve been part of,” he quips, exhaling an exuberant sigh of relief. The end product Hymns is the work of a band after metamorphosis. Gone are the spiked guitar interplays, frantic stick work, and barked vocals of Helicopter, Banquet and Kettling and in their place, buttery smooth slowed-down R&B jams that meld with synthetic soundscapes—only recognisable by Kele’s trademark vocals, the one time voice for agitated millennial urbanites. It’s a change that has been met with some critical criticism, and one that Justin is forearmed to answer. It’s this stripped down sound that Justin claims is a natural progression related not to line up change, but to what Kele and Russell were doing outside the band. Bizarrely, as the Hymns cleared the final hurdles, Bloc Party were still without a replacement for Matt Tong, relying on session drummer Alex Thomas to stand in on certain tracks. As Justin explains, it wasn’t until early summer; only weeks before the trio were due to play California’s Glass House Festival that a permanent replacement—20-year-old Louise Bartle—was found. He pauses, thinking back to the time they first met. “I remember walking into the studio for live rehearsals and being completely bowled over by her. I could tell she was nervous by the whole experience, but she’s had the confidence of youth, she threw everything at it. An utterly refreshing presence to be around, maybe even more so as I don’t tend to hang around with 21-year-olds,” he jokes, hesitating for a moment to consider the genius and/or daftness of the remark. Unlike Bloc Party’s 2013 headline performances, which commenced with the departure of drummer of Matt Tong and culminated in one omnipresent question mark hanging over the band’s future, Bloc Party’s 2015 comeback tour affirmed the band’s fate, one that Justin is fully committed to. There’s a good chance we’ll be releasing something within this record cycle, maybe even later this year,” he adds. As the summer roster fills up for yet another hectic festival season, Justin tells me the best is still to come from a band revitalized. 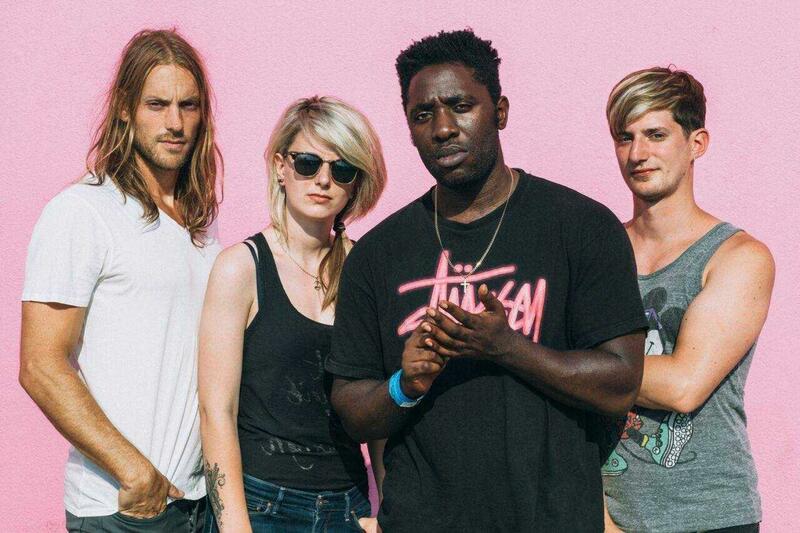 Like Sanders, the odds will never be in Bloc Party’s favour to dominate—but with Hymns they’ve stamped their calling card, they’ve made their mark, and boy do we love a trier.